I was browsing the archives of the excellent site MoCoLoco when I came across the Mystic Sink. I can't pick an adjective to describe it, but some that come to mind are: Stunning. Dramatic. Amazing. Jaw dropping. Beautiful. Gorgeous. I could go on, but instead I'm going to just go with an exclamatory "Wow!" for now. Of course, this isn't a very practical sink. It's 50" long but only 14" wide, and a shallow 4.5" deep in the "deep end." And, you know, the faucet isn't very near the drain. 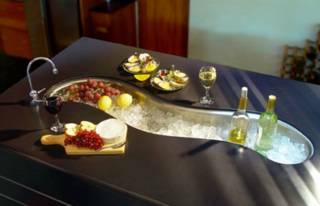 It's clearly not meant to be a primary sink, but would go great on an island bar if you have the room. 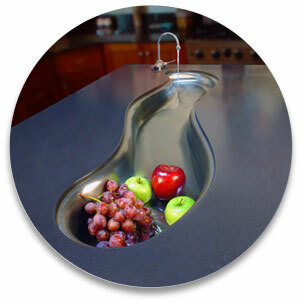 I'll be honest, I don't care if it costs $1,755.00 or that it's not remotely practical as an everyday sink. I'm willing to work around its eccentricities. I'm willing to suffer for the sake of art. I want one. Just started reading last week (BoingBoing had linked to you...), but this is far and away the coolest thing I've seen on the site. Where can I get one?? ?